HEAR YE! HEAR YE!! NEW PARTNERSHIP ANNOUNCEMENT !!! Hello to all of our friends and family out there , we are here to make an announcement of epic proportion. 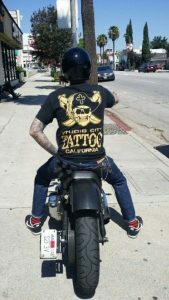 If you know Studio City Tattoo, then you know of their reputation for high-quality workmanship that comes out of their Pirate themed tattoo shop, so this new partnership we are about to tell you about shall come at no surprise. We are humbled and honored to announce that we are now partnered with BWL, Bill Wall Leather Artisan Jewelry, out of Malibu. We are just one, of the very few “Authorized Dealerships” where you can come inside and purchase your very own premium piece of Bill Wall Jewelry. We will also be glad to work with you, to help you design your very own custom piece if you so desire. Custom pieces are hand- crafted and autographed, by Bill himself. All of Bill Wall’s designs are either limited editions or one of a kind piece. His jewelry is worn from connoisseurs to rock stars, men, and women, and people travel the world over, just to be able to come and have their very own creation. His craftsmanship is praised worldwide. Bill Wall uses the highest quality metals and gemstones to create his works of art. Studio City Tattoo and Bill Wall are also collaborating on a specially designed ring that will include the Studio City Tattoo Logo and Bill Wall’s Artistic design. It will be a Limited Edition, and I have no doubts it will be absolutely stunning. So, what are you waiting for? Come on in and see for yourself what all the fuss is about. Trust me, you will be floored at the craftsmanship and beauty of these pieces of art that you can wear out, and show off. Not only do we wear and carry BWL, but we’re also lucky to have a few of Bill’s personal items that he has worn and they’re signed on display for sale. BWL makes beautifully crafted jewelry made from the finest materials on earth and beyond!Stop in to see our excellent collection of BWL treasures and let us show you the full line of jewelry in a unique leather-bound catalog. We can get what you want within a week. Not only can you pick something beautiful but we can get it custom made to your desires. My favorites BWL rings are the Super Custom Graffiti Master Skull Rings. We have a couple at the shop so stop in. Jewelry not only has to look good, but it has to make you feel good wearing it. BWL is so comfortable wearing it you might never take it off. It has a way of becoming part of your lifestyle. If you stop in and purchase one of these treasures, we can send it to the Master jeweler Bill Wall and have it engraved for you to customize your beautiful new acquisition. Stay tuned for something very special on the horizon. Ok, we’re so excited that we can’t wait to tell you about the surprise.We have a collaboration coming soon, and together with BWL. Bill Wall will be designing our Studio City Tattoo pirate ring! This unique limited edition shop pirate ring made by BWL will only be available through Studio City Tattoo! There are only 100 of these rings being made. The Bill Wall Leather / Studio City Tattoo shop pirate ring will be available soon. The Captain with gem eyes and extras. The Admiral will be a one of a kind no holds barred top of the line ring for the discriminating pirate who has everything. You will be able to customize your ring as you see fit making it a one of a kind end all be all treasure. After all, isn’t it all about TREASURES? Limited Edition 100 rings available. Movie stars, rock stars and outlaw bikers. Movie sets- mug shots and red carpets. Bill Wall’s artwork, in leather and jewelry, has adorned the famous and infamous since 1985. The common thread? Bill’s appreciation for simple, elegant design, a crystal-clear sense of what’s cool and his insistence upon working with only the finest quality materials. Every Bill Wall creation is a personal statement that comes through careful choices in materials, form, and function to yield a unique, one-of-a-kind piece of art to express your attitude and lifestyle. The BWL brand was established in 1985 in Malibu when a 20-year young Bill learned that leather apparel could be useful when crashing a motorcycle. Surfing, fishing and working on cars, surrounded by mountains and a view of the Pacific always present, after his accident Bill used an industrial sewing machine to render a few scraps of leather into an outstanding outfit to protect himself on future rides. Feeling a need to impress the girls, young Bill next got into making jewelry. What better reason? Using only sterling silver and materials selected with the utmost care, the Bill Wall brand boasts a craftsman’s spirit. Bill carves original models for each piece directly out of silver blocks and then replicates them through careful casting, always in limited numbers. His precise craftsmanship is acclaimed worldwide by customers who appreciate the best in all walks of life. Growing up in a creative environment, surrounded by surfers, celebrities, and 1-percenters, Bill’s do-it-yourself approach has always shown through in his work. As the Bill Wall Leather brand achieved widespread fame, nothing has changed. This sensibility resonates with every customer and is evident in every piece of his art. You need his unique statement in your life, and we hope you enjoy visiting Bill’s on-line store.